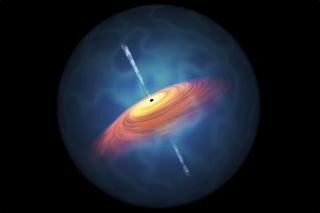 An artist's conception of a quasar surrounding a supermassive black hole, which has a mass many times that of Earth's sun. Although nothing that falls into the black hole can escape, its massive gravity accelerates an "accretion disk" of luminous particles and gases around it. More precisely, the researchers have detected quasars, or huge, luminous disks of gases and dust that surround supermassive black holes. (The black holes themselves emit no light or energy, of course, though friction from the matter that swirls around and ultimately into a black hole's "mouth" does spit out immense light.) The quasars and their central black holes are 13 billion light-years away from Earth, meaning scientists are seeing the objects now as they appeared only 800 million years after the universe formed. Quasars are the brightest objects in the universe, and they are found only around black holes that are millions of times the mass of Earth's sun. The most distant quasar ever found was detected by the light it gave off only 690 million years after the Big Bang. Of the 83 newfound quasars, the most distant one is 13.05 billion light-years away from us. That means its light started its journey to the telescope lens within the universe's first billion years. This quasar is tied with an earlier discovery as the second-most distant quasar ever found. Light from one of the three most distant quasars ever found, which surrounds a supermassive black hole 13.05 billion light-years from Earth. The new finds suggest that in every cube of space that's a billion light-years per side, there is about one supermassive black hole and an associated quasar. A hundred quasars found in a survey by the Subaru Telescope: The top seven rows are 83 newfound quasars; the bottom two are 17 quasars that were already discovered. The study's findings are important because they're a window into the earliest days of the universe, after it transitioned from a mélange of hot subatomic particles into something a bit cooler and more organized. The early universe spent several hundred million years in darkness before its first stars formed; the oldest sign of the universe visible to astronomers goes back about 13.6 billion years. Soon after the first stars formed, hydrogen gas across the universe went through a period of re-ionization, when something very energetic split the atoms back into individual protons and electrons. Scientists don't know exactly what provided this energy, and quasars were one potential suspect. But the Matsuoka team's work, published Feb. 6 in The Astrophysical Journal Letters, suggests that there weren't enough quasars to do the job. Instead, the source of the re-ionization energy may have been newborn galaxies.